Matangi, who originally lived in the Hawkes Bay, decided to re-settle his people on the other side of the Ruahine/Tararua Ranges. They built a village just north of the Manawatu River but many of his visitors disappeared without trace. A huge taniwha which lived in a lake near the river was killing the people. 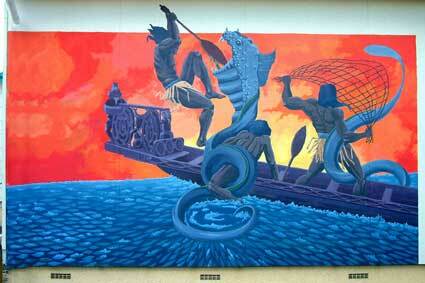 Matangi and twelve warrior set out to track and kill the taniwha. Using some of his men as bait, they lured the taniwhat out of his lair, snared him with ropes and killed him. Himatangi - the place where Matangi went fishing for a taniwha or "the fishing of Matangi". Hi - to fish with a hook or a line. Matangi - a local chief.